Bringing HealthStreet’s 7th Birthday Celebration to You! 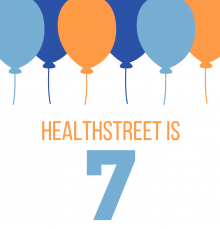 The HealthStreet Team is excited to be celebrating seven years in Gainesville! On Dec. 3rd, our community health workers, volunteers, and staff will be performing “Pop-Up” stops all around town to raise awareness about HealthStreet and our aim to improve the health of our community. In line with our mission to bridge gaps in health care and health research, our staff will provide health education, health promotion, and referrals to community-based services. The Pop-Up stops will include a mobile clothing closet with donations to those being served by our partnering community organizations. If you’re interested in donating items for our clothing closet and toiletry pantry, please call 352-294-4871. It’s been a great seven years and we look forward to many more years of serving our community and advancing health equity. When you see us around town be sure to grab our latest calendar of events! See you on Dec. 3rd!